This season figures to be something of a referendum on John Groce. After igniting a fanbase accustomed to to Life on the Bubble by starting his tenure with 12 straight wins, the coach has gone 65-61 since. The problem is not very hard to identify, either. Unlike his predecessor (who was defined by consistently solid defenses), Groce's defenses have been good (2014), bad (2016), and average (2013 & 2015). But like his predecessor, Groce's offenses have been uniformly bad, with the notable exception of an average showing in 2013 (not coincidentally, this was the last time Illinois made the NCAA Tournament). Indeed, Illinois fans that enjoy watching an efficient offense have been dying of thirst in the desert. Not since Dee Brown was suiting up for the Illini (a soundbyte I'm sure he's sick of hearing by now) has Illinois finished with a top-four offense in the Big Ten. And in only one of those seasons—2011—did the Illini finish in the top half of the conference in offensive efficiency. Ten years, and only one top-half finish. That was so long ago, the aforementioned Brown has retired from playing basketball, and is now on Groce's staff. For Illinois' sake, one hopes Brown can impart some offensive wisdom to the team. He would be in a position to know, as he was the most offensively efficient player (138.6 Offensive Rating in Big Ten Play) on one of the most offensively dominant teams (1.3 Offensive Efficiency in Big Ten Play) in Big Ten history. I won't deny that much of the intricacies of basketball are better left to the experts, but there is quite a bit of low-hanging fruit for us armchair analysts. And perhaps none more reachable than the maxim that mid-range shots are bad shots. It's become the rallying cry for the analytical community within basketball much the same way the importance of on-base percentage ignited the "Moneyball" movement in baseball. To the uninitiated, players generally are as accurate on mid-range shots as they are with 3-pointers, so it makes little sense to opt for the 33% point penalty. Moreover, players do not earn as many trips to the free throw line on mid-range shots, and offensive rebounds are harder to come by for a player who has just attempted a 15-foot jumpshot. Basketball games are won by outdoing your opponent in terms of maximizing opportunities for shots (limiting turnovers, offensive rebounding) and maximizing the amount of points per shot (via accuracy and potential points per shot attempt). 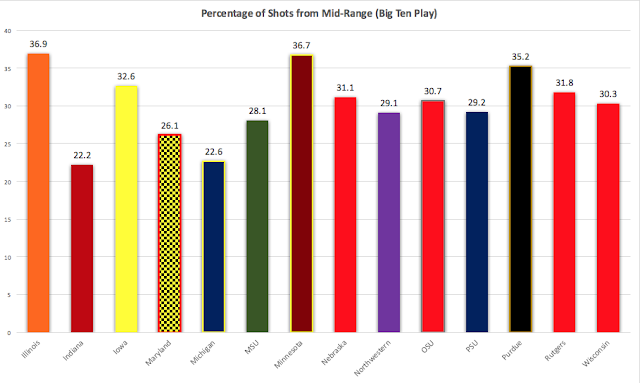 By relying on so many mid-range shots, Illinois puts itself as a considerable disadvantage. Longtime readers of this blog (hi Mom!) will note the broken-record still has not been removed. When I am finally diagnosed as insane and hauled off to the asylum, I have no doubt they will say I would not shut up about Illinois' reliance on mid-range shots. Normally in a team preview I would talk about how the team did last year, who leaves, who comes back, and who's entering the program. And there are a countless other places you could go to read up on Tracy Abrams (a point guard that has not shown an ability to make 3s), Mike Thorne (a big man who has not shown an ability to convert at the rim), and Malcolm Hill (the offensive epicenter who attempted more mid-range shots than shots at the rim and 3s, combined). Not here. Suffice to say, there's enough talent here to make the NCAA Tournament with room to spare, but not enough to win the Big Ten. But that's been more or less true for a decade, and in only a couple of instances did the Illini tilt toward the overachievement end of that spectrum. For Illinois to make noise this season, it needs to take better shots. Everything else is just, well, noise.